In the midst of the summer equinox, FUTURE Designs has explored the effect that light levels can have on the circadian rhythms of two volunteers in its experiment: Light Work Sleep (main image by Vita Munchak). An ever-growing reliance on technology and the longer summer days is assumed to over-stimulate and exhaust us, so with the help of sleep expert Dr Neil Stanley FUTURE Designs set out to test this theory. Taking place at its new Technology Hub in Clerkenwell, lighting manufacturer FUTURE Designs created two makeshift ‘bedrooms’ and lit them to the extremes of the Kelvin scale. One side was a cool 6000-Kelvins, the other a warm 2700-Kelvins and each became home to volunteers of similar age, weight and height for 24 hours in a simulated ordinary day. Dr Neil Stanley measured memory, reaction time and vigilance throughout, and questioned them on mood and alertness. While the experiment’s results can in no way be conclusive, it uncovered some interesting trends. Prolonged exposure to 6000K cool white light led to a decrease in alertness, particularly in the afternoon and evening, possibly owing to it opposing natural changes in sunlight. While the study highlighted some useful trends, it is seen that personality and motivation plays an equal part. A bright summer’s day can have different effects on individual’s moods. Dr Stanley summarised: ‘While tunable white light may have the ability to modulate alertness and performance it is only one of many factors that affect our everyday life; the relative contribution of the effect of light on everyday alertness and performance needs to be elucidated’. 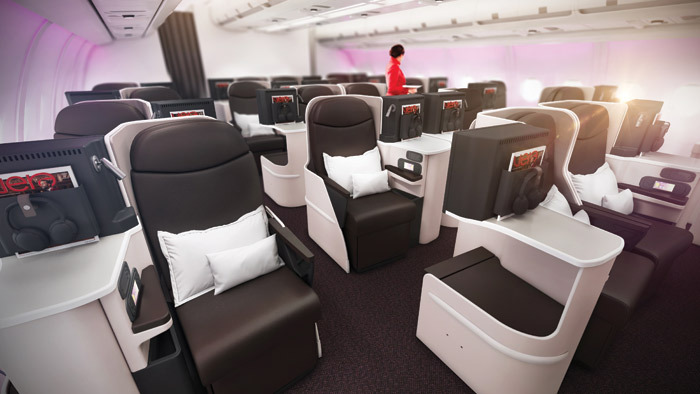 A new fleet of Airbus A330- 200s has a.orded the Virgin Atlantic in-house design team the opportunity to bring a refreshed, distinctive design to its cabin interiors. Cabins will be retro.itted with Virgin Atlantic’s signature Premium cabin design, with Upper Class cabins overhauled to reveal sleek and comfortable fittings, while still in keeping with the company’s distinctive style with all seats upholstered in Espresso leather. Economy class will get additional touches of the Virgin Atlantic style in red and beige tones. New leather headrests are set against Black Cherry furnishings along with refreshed bathrooms and ambient mood lighting. K&S lighting has stepped outside of its comfort zone in architectural lighting and creative installations to explore light and sound on the big stage. 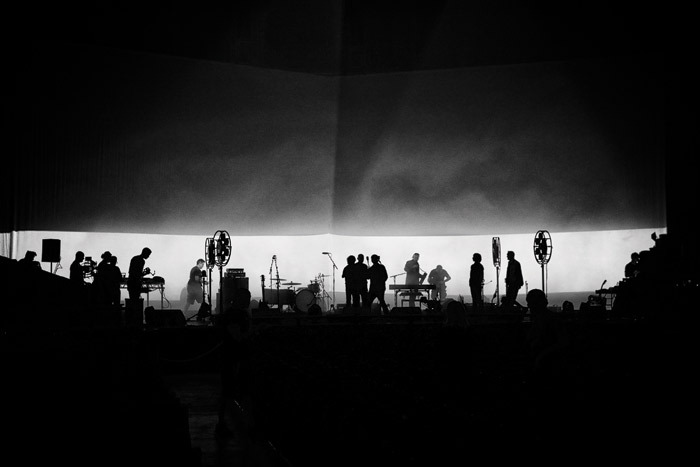 Collaborating with singer Matt Johnson for his comeback tour with band The The, Kate Wilkins worked with video artist Vicki Bennett to produce a sensory spectacle with light, sound, form and music. It will follow the tour internationally, adapting to all types of venues – most notably the Royal Albert Hall and the Sydney Opera House. Returning to Regent’s Park for a second year, Frieze Sculpture brings works by 25 artists to central London with the support of some of the world’s leading galleries. This year sees the logistic partner, Mtec, support two emerging galleries in covering their costs to participate. The selected rising talents are the Hannah Barry Gallery with Treadpads (2018) by James Capper, and Copperfield with Pan African Flags for the Relic Travellers’ Alliance (2018) by Larry Achiampong. 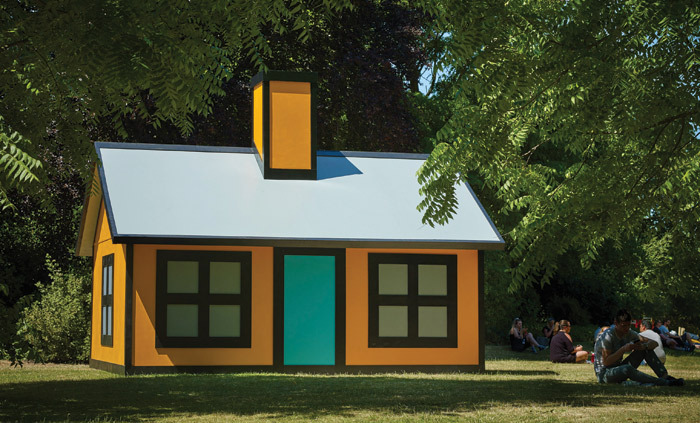 One of artist Richard Woods’ holiday homes (shown above) will reside in the park. Previously seen at Folkestone Triennial and the Skip Gallery, his work aims to encourage people to consider the implications that multiple home ownership has on an already unstable housing market. Also exhibiting are: John Baldessari, Rana Begum, Yoan Capote, Elmgreen & Dragset, Tracey Emin, Tim Etchells, Rachel Feinstein, Barry Flanagan, Laura Ford, Dan Graham, Haroon Gunn-Salie, Bharti Kher, Kimsooja, Michele Mathison, Virginia Overton, Simon Periton, Kathleen Ryan, Sean Scully, Conrad Shawcross, Monika Sosnowska, Kiki Smith and Hugo Wilson. 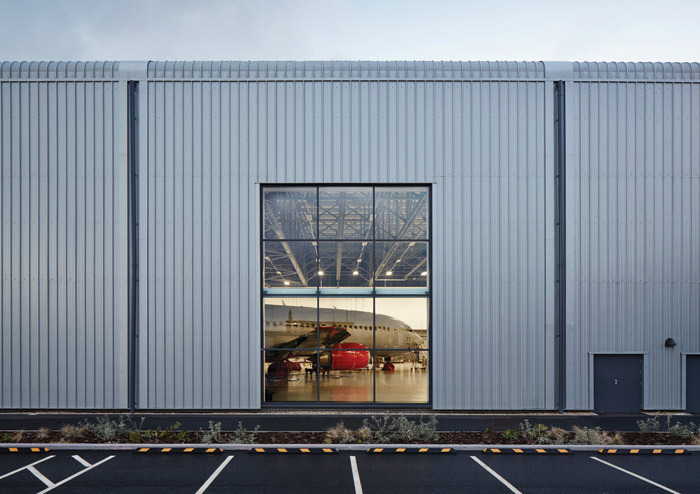 London-based architecture practice Hamson Barron Smith has refurbished and extended a Thirties’ hangar, next to Norwich Airport, for client Norwich City Council. The practice has retained and reconditioned the original steel truss roof, providing a background of riveted universal steel angles, channels, sections and secondary connects between the trusses. With the practice’s scheme the space now hosts a teaching zone of 20 classrooms, workshops and aircraft simulators; and an ‘emulation zone’ containing a helicopter and Boeing 737 for training. Back in February FX featured the University of Birmingham Indoor Sports Centre by Lifschutz Davidson Sandilands. Having already received a Civic Trust Commendation and West Midlands Property Award, the centre has now been named as one of two National RIBA Award Winners in the West Midlands. This recognition comes after the city’s successful bid for the 2022 Commonwealth Games, to which the facility was central in securing. A trailblazer group of 20 architecture practices, chaired by Foster + Partners, has created the UK’s first Architecture Apprenticeship Standards. Now approved by the Institute of Apprenticeships, they will comprise a Part 1 qualification and Architect (Parts 2 and 3) and be on o.er through UK universities from this September as an Architect’s Registration Board qualification. It is set to revolutionise architectural education, not just in providing practical experience and improving the link between practice and academia, but also in providing a platform to increase diversity in the profession. Apprentices will be exempt from tuition fees and also will receive a salary and employee benefits. After three years as director of design, exhibitions and FuturePlan at the V&A, David Bickle has returned to Hawkins\Brown as a partner. After his 21-year career at Hawkins\Brown previously, Bickley has returned to a key role in its civic, creative and cultural sector, alongside the strategic development of creative practice and research within the studio. In its 250th year, the Royal Academy presents its inaugural Festival of Ideas. From 7 to 16 September, the event will celebrate creativity, culture and critical thinking in the new 250-seat Benjamin West Lecture Theatre. Among the speakers taking part, Thomas Heatherwick RA will be in conversation with the Royal Academy’s head of architecture Kate Goodwin, and photographer David Bailey will joining the RA’s artistic director Tim Marlow, to discuss his 60-year career. Kelly Hoppen has launched a new collection of commercial fabrics for Richloom. With a wealth of experience in hotel interiors, Hoppen has drawn on this knowledge to produce materials with maximum tactility in mind, focusing on luxurious textures and colour combinations. The collection items are designed to be used individually or in combination. Interface has become the first global flooring manufacture to declare all of its products carbon neutral across the entire product lifecycle. It is also offering all customers the Carbon Neutral Floors programme free of charge, to help clients meet their sustainability goals and reduce the impact of their projects. It is estimated that Interface will offset 400,000 tonnes of carbon emissions in 2018 with this programme, equivalent to half a million acres of forest.